Outstanding food, a licenced bar, petting zoo, plenty of space to play and dog friendly too. Families of Melbourne, such a place does exist and that place is the Piggery Café. Going out for Sunday lunch is a guilty pleasure I think most of us enjoy. However, to find somewhere that ticks all boxes for all family members (including the dog) is not an easy task by any stretch of the imagination. It is my pleasure to announce that I have found such a place and it is fabulous! The Piggery Café is located in the Dandenong Ranges, across the road from a beautiful walk that leads to Sherbrooke Falls. We parked up in a large free car park and walked up to the chocolate box old pig barn. This beautiful rustic looking building is home to one of the finest bakeries in Melbourne. Burham Bakery supplys baked goods to some of Melbourne's top restaurants including Rockpool, Bistro Guillaume plus many other other prestigious culinary names known throughout the city. As we walked into the huge enclosed grounds, we were immediately impressed by the amount of space for the kids to run around in; even for the most active of children. Miss 3 loved getting creative with the large soft foam play equipment, and of course hitting mummy and daddy over the head with a noodle! May I add after being hit on the head numerous times by one of the noodles I can assure you they are very soft. 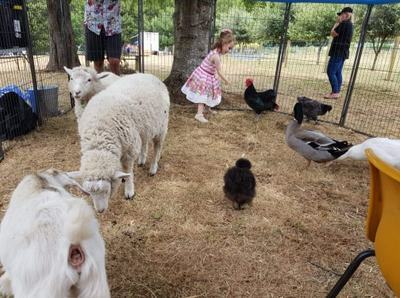 We were lucky enough to go on a Sunday when the Piggery offered a petting zoo on the grounds for little ones to enjoy. 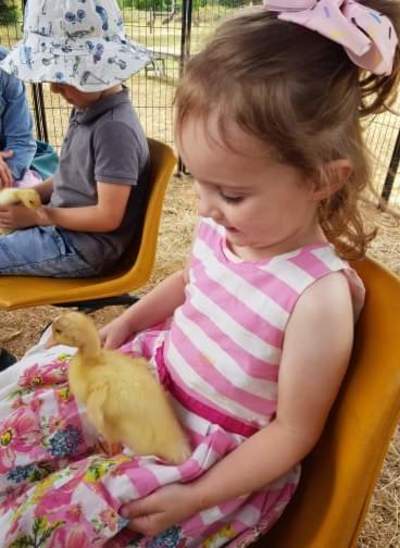 Note this was an additional charge of $5, which was well worth it to see Miss 3s face when holding a little duckling. Absolutely priceless. We had a table inside over looking the gardens, though I did notice that some of the tables had toasters on them - yes a toaster, on the table! I guess when you bake some of the best breads in Melbourne on site it would be rude not to enjoy it. It also means that if your fussy little darling is going through a phase of only eating toast even they are catered for. Genius! There were lots if tables outside and undercover, where dogs that are kept on a lead are permitted to sit. Note that dogs are not allowed inside the building. The menu has a range of childrens meals, breakfast options, brunch, lunch and dessert items. Now I will admit choosing was not easy as everything looked (and smelt) so delicious. There are gluten free, diary free and vegan options available upon request, too. The licenced bar serves local wines and beer, plus a wide variety of teas, coffees and soft drinks. I'd recommend the homemade lemongrass and ginger iced tea - it was fabulous. For those that just want to enjoy a drink and/or a cake/cookie to enjoy in the stunning grounds there is a takeaway counter. Or to take your treats with you on one of the beautiful walks around Sherbrooke. The Piggery Café is one if the few places I've been to where every box for every family member is catered for. Also worth noting the grounds are pram and wheelchair friendly. They also serve afternoon tea after 2.30pm so I'll be back at some point to try it.. I'll keep you posted on my findings.